My sewing studio is narrow but long. The "design wall" is a sheet (currently black) hung in front of the shelves that hold my containerized stash. The distance between the "design wall" and the other side of the room is about 12 feet, of which 3 feet is taken up by the width of the shelving units and my sewing cabinet (which is directly across the room from the shelving units). It means when the project that is pinned to the "design wall" gets large enough, I can't back up FAR enough to get the entire thing in the picture. And so it is with this picture .... I was literally bending over my sewing cabinet backwards to get the camera lens far enough away to encompass the whole project. The pain I go through for creativity! :-) Even then ... I couldn't get ALL of the finished hexies in the frame. I've just pinned each hexie unit (flower plus green path) to the sheet, in no particular order. 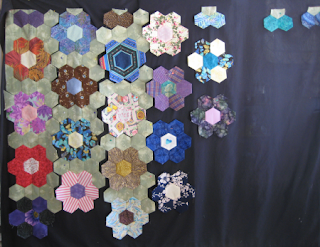 Once I get all the hexie units stitched, THEN I'll be concerned about placement. Since this is a Forever Project (™), I have all my supplies in a Grab-n-Go box. Here it is, opened up. 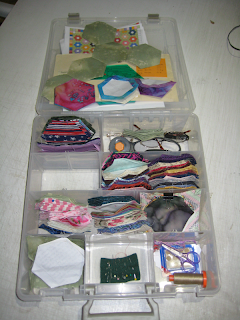 I have all my prepared hexies, both the flowers and the green path ones; scissors; thread; needles; pins; extra paper templates; magnifying/reading glasses. 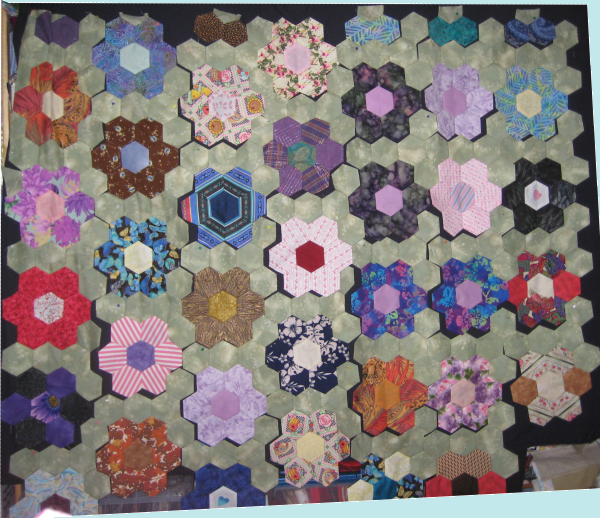 All of the prepared hexies have been grouped into flower units and clipped or pinned together. Ditto with the green path hexies. I know I don't have enough prepared green hexies for all the flowers, so at some point, I'll be needing to cut more green fabric and prep those hexies. I also have a small cutting board, rotary cutter & acrylic hexie template for when I was also cutting out the fabric hexies. 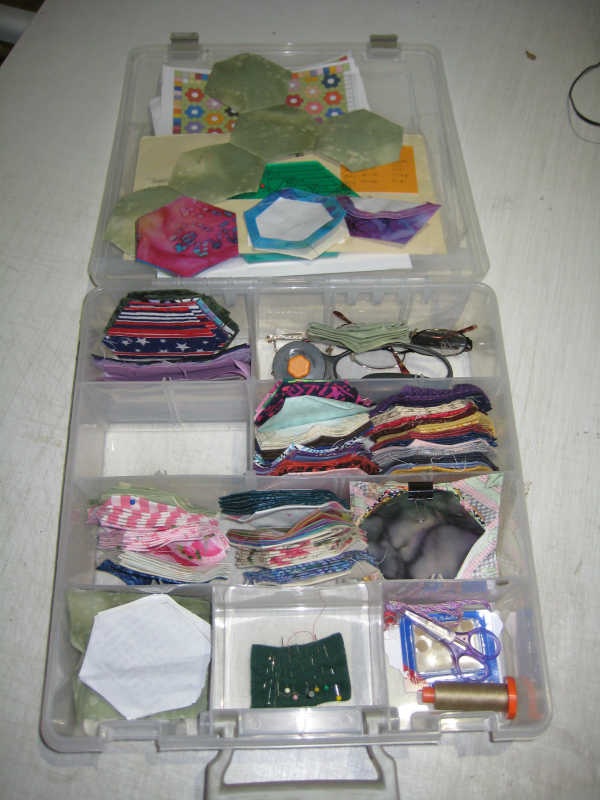 When I need more of the green hexies, I'll cut some green strips at home, put the strips in the box and when I need to prep them, then I'll cut the fabric with the cutting supplies in the box. I'd hate to be lacking some supplies, when away from home! With everything I need in one convenient totable box that I can grab on a moment's notice, I'm always ready to have something to do on car trips. 1. Hawaiian Applique. This project was started in January 2013 and the top was finished in May 2013. The pattern is for the center medallion only; I added on the borders to make it a more useful size for me. 2. Podcats throw pillow. This project was started AND .. omg .. FINISHED in February 2013. I was attracted to this pattern because the Pirate family has 3 girls. By no means are they like three peas in a pod, but I do tend to buy them items in three's ... especially if those items are in "their colors". 3. Manzanita. This project was started in February but the applique wasn't completed until April 2013. I did love doing the applique but it's a "dark" project ... very stark. I wasn't depressed or feeling sad when I bought the pattern; it simply appealed to me. Since I learned how to do needleturn applique, I really adore doing those skinny little shapes and fine points. 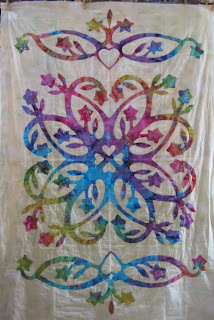 I'm certainly not intimidated by any applique any more! 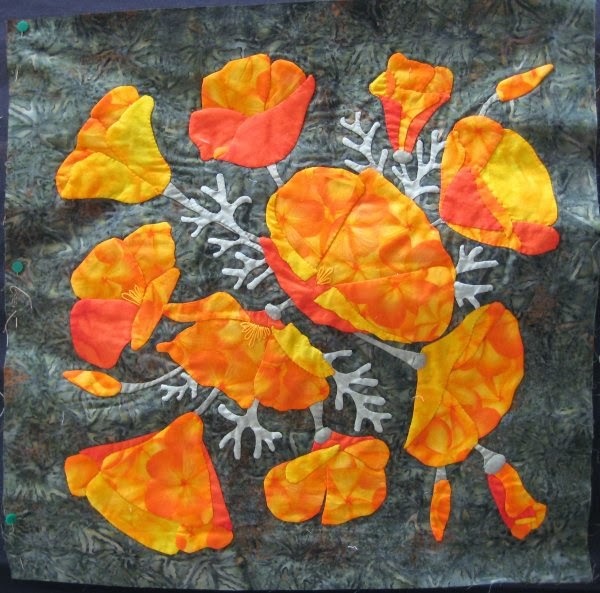 There are leaf-shaped leaves to be sewn to the branches and some interesting shaped borders to be applied. It's still at this stage. I probably ought to look around the sewing studio and find it. Wherever it's hiding. 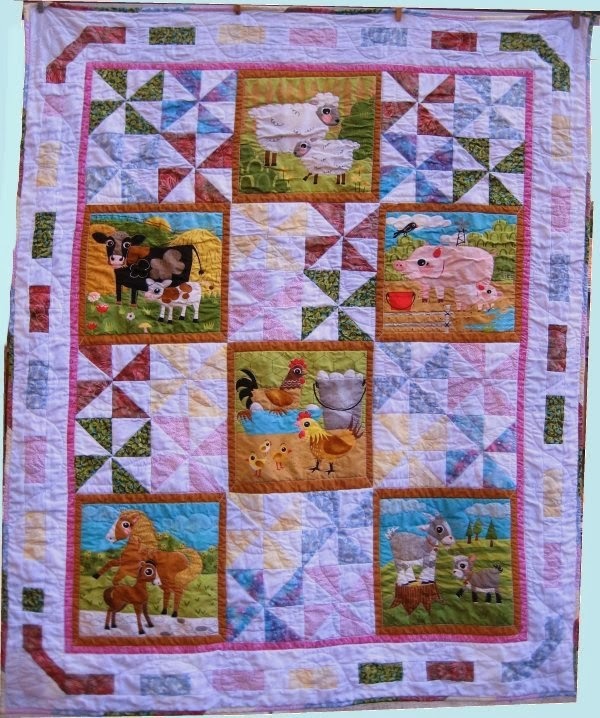 Nothing is sadder than a quilt, designed to be used, that is folded and put away because "it's too pretty to use". their use of color and fabrics was wonderful. How could I resist when the pattern was combined with pre-selected fabrics? I started work in May 2013. The applique for the stems (all those skinny stems!) went rather nicely. It wasn't until I got to the actual flowers that my enthusiasm began to wane. The fabrics "they" chose didn't have enough contrast to effectively show shadows. a way for me to use a "new" technique in making pinwheel blocks from (2) 5"x10" rectangles. It ended up being sent, along with 11 other quilts that I had previously made, to the tornado victims in Moore, OK.
2013. I have no idea (at this point) what took me so long other than ... it just did. 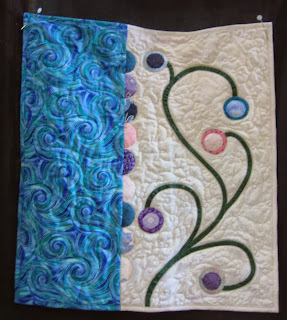 finished, quilted, labeled, bound and *delivered* by August 2013. 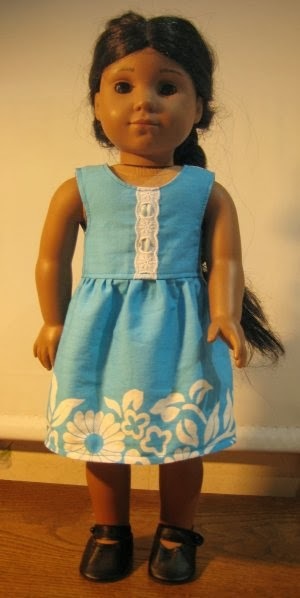 Because the older sister has an American Girl doll, I also made a matching quilt for the doll .... a project that morphed into a wardrobe of all sorts of clothing for the doll. It was waaaay too much fun! about to be born and I needed a new baby quilt. Everything was completely done in August 2013. Dang. August was really a busy month, wasn't it? 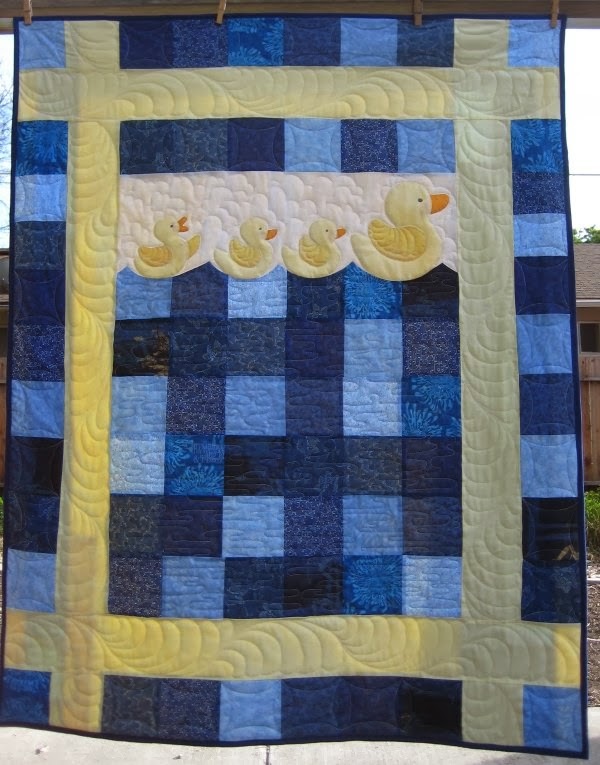 This was kind of a "cheater" quilt, in that I used a pre-printed panel, but cut up the sections and added some other elements. There were a number of ... um ... "opportunities for creative problem solving" associated with this quilt, but in the end, I think it came out nicely. 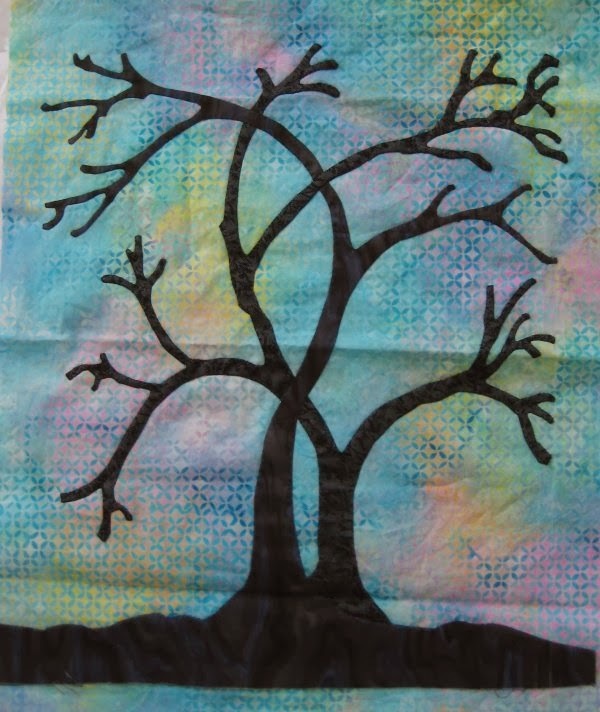 hand-quilt. She creates tops under duress, simply to have something to hand-quilt. 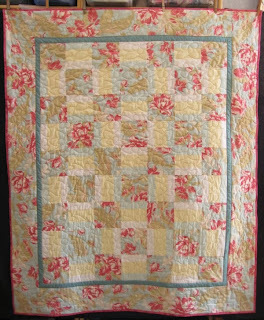 I had a hand-pieced top that I wanted hand-quilted. I do not hand-quilt. So, we bartered .... 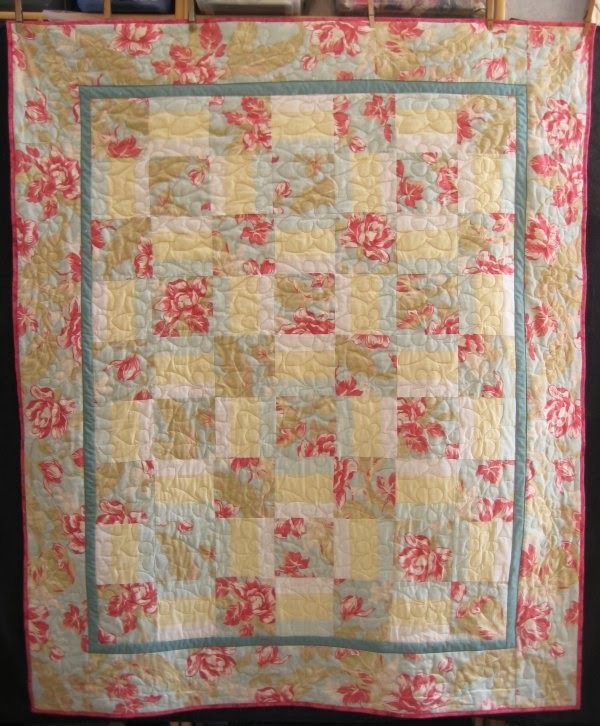 I would sew a top for her, using her fabrics & pattern and she would hand-quilt for me, using whatever quilting motifs pleased her soul, a double-sized (I think) quilt. sister (a rank beginner sewer) had made for her own little girl. Then I was to quilt it. 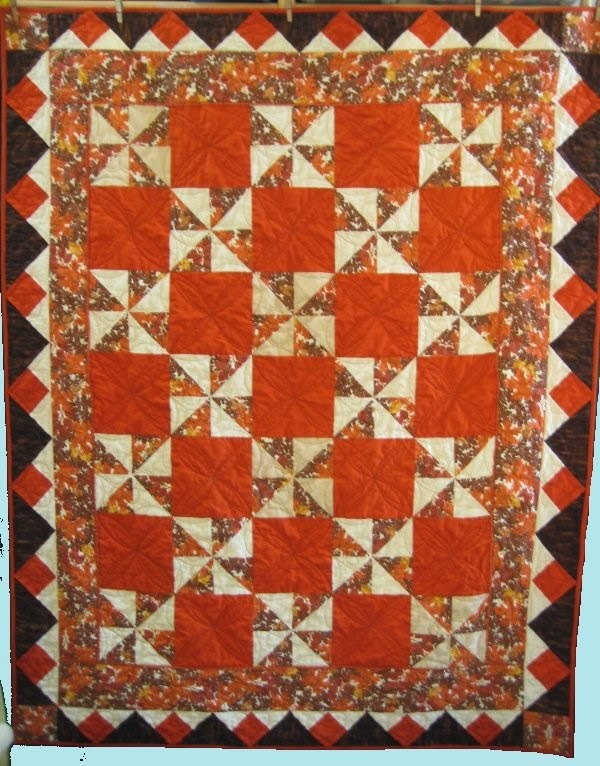 The sister did a *wonderful* job of piecing and it was a pleasure to quilt. 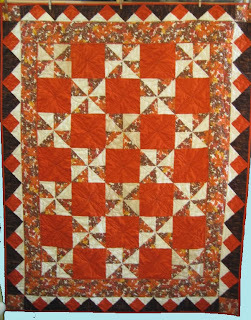 I quilted the center with a pantograph and gave the borders a separate treatment, using the design in the pantograph as the basis. borders. It's supposed to have small LED lights poking through buttonholes in the center of the snowflakes, but almost everyone that has done it that way has complained that the wall-hanging will not lie flat due to the wires and cords of the lights. Instead, I am taking their suggestions to put hot fix crystals in the centers instead. This project was started in October 2013, was delayed and deferred for several reasons but finished (except for the crystals) by early December 2013. 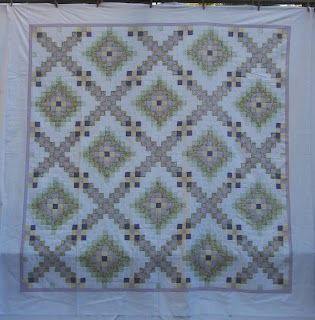 In fact, because it's not completely done, I don't even have a picture of the completed quilting nor made a web page for it. Soon .. very soon! So, what am I working on right now? are doing .. oh no! I want to actually get this project FINISHED at some point, so my hexies are on the large size. 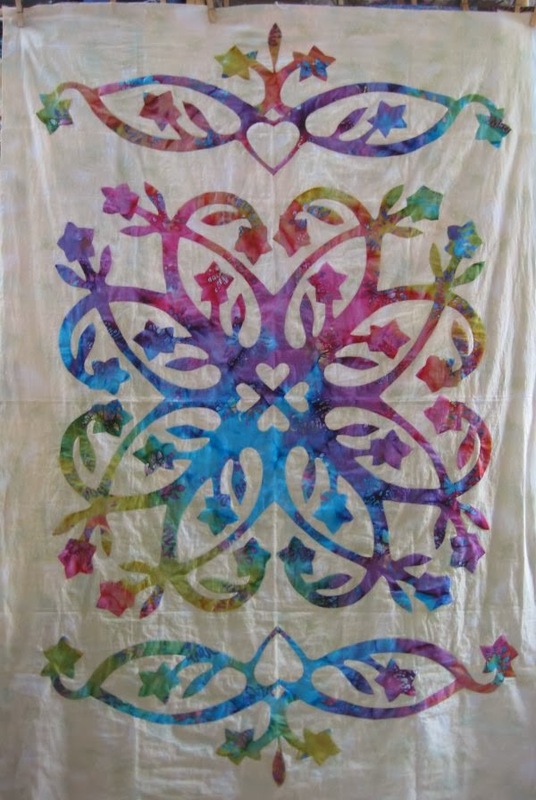 I've already figured out how I'm going to machine quilt it, so I'm eager to get it done. This was started in July 21013 and is a work-in-progress. The picture that I have here is from October 2013. I've done quite a few more since then but don't have a picture of it. 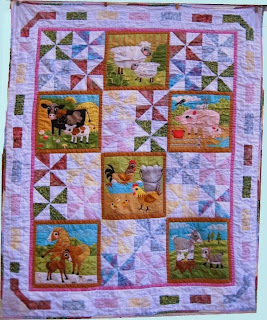 2. charity quilting. I have volunteered to quilt some charity/outreach quilts for the quilt guild I belong to ... so the last of those is on the frame. Once it is done, I'll need to decide which one of *my* tops will get quilted next. I *really* want to substantially reduce the number of tops I have (literally) hanging around so I don't feel quite so anxious about them. And that's what I did this past year and what I'm currently working on. My embroidery machine is a Janome 300e. I bought it in 2004. It's been wonderful. 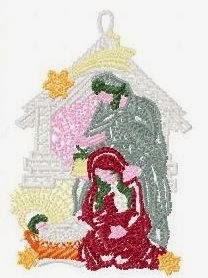 It absolutely has opened my eyes to all the possibilities available in the machine embroidery world. Recently, via a subscribed email, I learned that Gorgeous Stitches was featuring a nativity design. 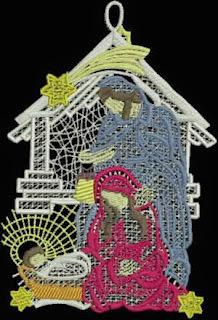 It is a free-standing lace design that can be used as a Christmas tree ornament. It's kind of a scribbly design but I liked the open lacey look of it, so I bought it. So, I looked at the thread color guide that came with the design and ... what's that *green*?? Their *HAIR*??? I don't think so. And I thought the pink as the interior of the stable didn't look quite right. I also wasn't quite sure what that light yellow "thing" was below Joseph's right arm. Or at least I think that's his right arm. Maybe my glasses need cleaning. I recolored the design so there was brown for the hair and a light gray for the stable interior. I pulled the threads and began to embroider. 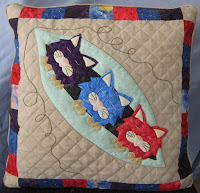 From past experience, I know that faster speeds for my machine doesn't necessarily mean a nicely stitched design. Because I'm not in a hurry, I usually stitch the designs at a slower speed. It gives better results for my machine. But ... alas ... my finished product was not nearly as pleasing in person as it looked on Gorgeous Stitches' website or even in the picture rendering of Embird. This picture is right off the hoop ... I haven't trimmed the tulle nor the water soluble stabilizer away. Maybe it was the threads that I used (Superior metallic, Coats & Clark trilobal polyester, Madeira rayon, Robison Anton and Floriani). Maybe it was a tension issue. 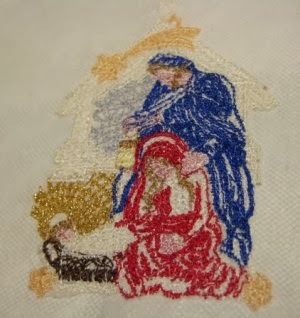 And that's a real shame because I've stitched out other Gorgeous Stitches designs before with lovely results. Ah well ... this design and my machine simply aren't destined to share the Christmas spirit with each other. 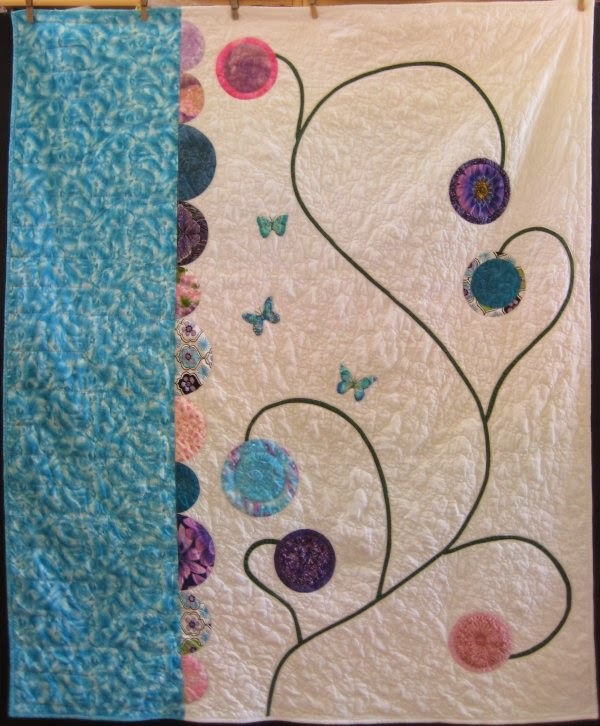 Back in July 2013, I made a personal sized quilt for a 9 year old daughter of one of Mr. Pirate's cousins. Technically, the daughter is a first cousin/twice removed, but that gets very cumbersome. She just calls us Uncle & Aunt. I found out from the Mom that the daughter had an American Girl doll, McKenna, who the daughter still loved. I offered to make a matching quilt for McKenna. The suggestion was enthusiastically agreed to. So, I made an almost-matching quilt, using the same fabrics as in the daughter's quilt. Then, what if McKenna didn't have a bed to sleep on? I had no idea, but poor McKenna, if she didn't. So I made her a mattress and pillow. Oh dear! What if McKenna didn't have any jammies???? Can't have our dear doll being cold in bed, can we? So a set of jammies was made with Winnie-the-Pooh light weight flannel. I attended a doll show, in the hopes that I would be able to pick up some American Girl "stuff". Just what sort of "stuff" I had no idea because I didn't have a clue what might be available. So, I went with an open mind, alert to possibilities. I was able to pick up some shoes (black Mary Jane types, a pair of sandals, a pair of blue "suede" boots and a pair of red rain boots), some socks, hair curlers (! ), clothes hangers, a beautiful hand-knit sweater and some other items that I can't quite remember. Once back home, I began to plan outfits that would use the items I had just purchased. It was summer time and warm weather was still here. McKenna surely needed a sundress! I had some gold-veined cotton that I made a drawstring dress out of, which coordinated with the gold sandals. And for the parties that McKenna would be going to, I also had some yellow/gold Sari cloth that was used for a party dress ... it also went nicely with the gold sandals. An ordinary sundress was made from turquoise cotton that had a white border print, using the same pattern as for the Sari party dress. 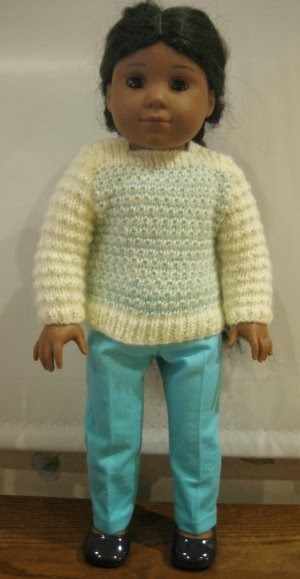 In anticipation of the coming Fall and cooler weather, I made a pair of trousers to coordinate with the sweater. 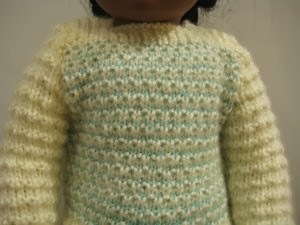 The sweater had off-white/cream sleeves and back with a mottled off-white/turquoise front. Gosh, it was so pretty! 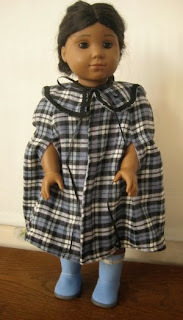 A blue/black/white plaid flannel was used to make a cape to coordinate with the blue suede boots. That would certainly keep McKenna warm! You know what REALLY annoyed me about this cape??? I was SO careful about matching the plaid at the side seams that I apparently completely IGNORED the most obvious place: the center front! Oh. My. Gosh. I literally stamped my feet on the floor when I realized that. Normally, I would have redone it but I didn't have any more of that plaid and neither did I have any other color fabric that would be suitable for a cape. Additionally, Mr. Pirate was harassing me to "get those doll clothes DONE before the girl graduates from college!". So, to my own everlasting disappointment, I let it go. I don't think the Mom or the daughter will ever notice it (neither is a sewer), but every time I see that photograph?? aarrrgghhh! It was late October when we last saw this project. 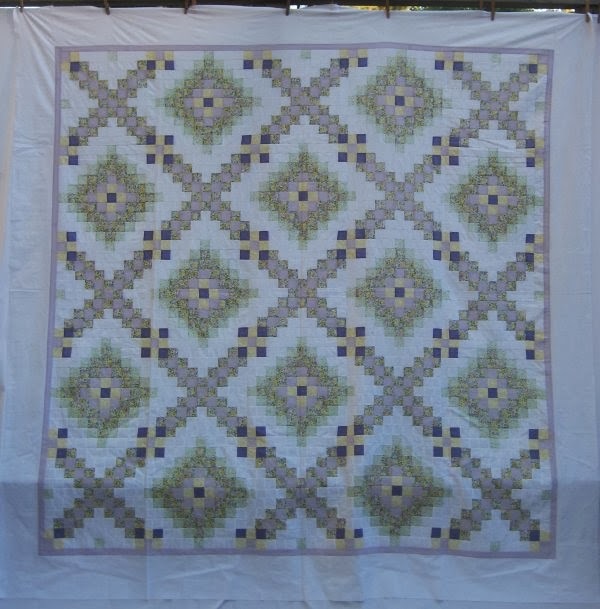 The piecing was done and had just been loaded onto my longarm frame. Then, the horrible happened ... my Dad passed away and everything came to a screeching halt. I seriously, *seriously* underestimated how long it would take to handle everything associated with his funeral and ... omg .. the paperwork. Right after that, Thanksgiving occurred and we were away from the house for about a week and half. But, events concerning my Dad's estate are kinda/sorta under control. Thanksgiving is over and done with. I really needed to get All That Glitters quilted and off the frame, since I had previously volunteered to quilt some charity quilts and 2 had been delivered to me. FINALLY .. last night, December 8th ... I finished the quilting for All That Glitters! 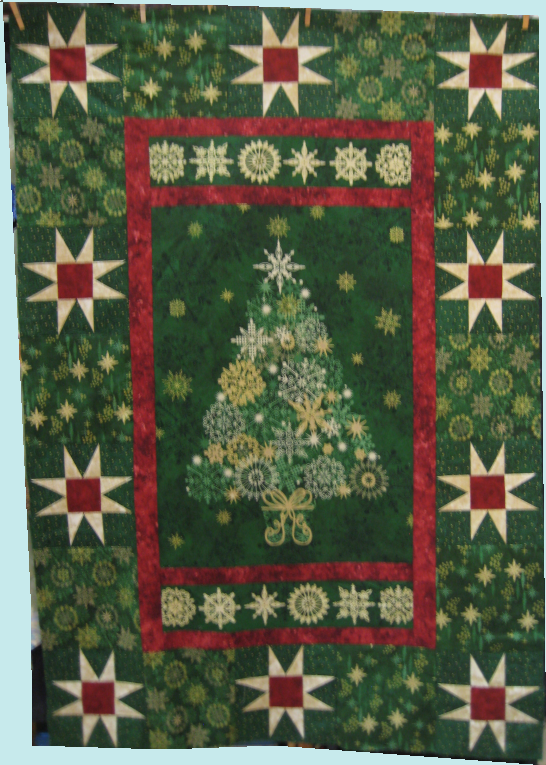 The border blocks: the stars were SITD with holly leaves quilted in the green squares & the red center square and nested loops in the green triangles. I used Glide thread in "Khaki", which is totally a bogus name. It really looks like a low-sheen, burnished Old Gold. Awesome thread, incredible color. Sashings are always a dilemma. Quilt or not? The photo shows the quilt hanging sideways on the frame. 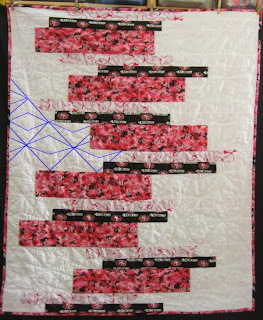 What looks like the top/bottom horizontal red strips are really vertical when the quilt is hung properly. They are 2" wide. The other red strips are 1-1/2" wide. I quilted nested circles in an alternating, wave orientation. I used red Glide thread. Awesome stuff. That left the tree in the center. With Glide "Khaki", I outlined every doggone snowflake. What a major pain to need to tie and bury all those tails, but I did. 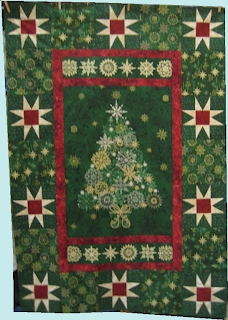 The background of the center medallion was densely quilted with nested clamshells in green, so the background would be flattened and the actual quilting wouldn't show ... all you'd "see" is the texture. This enabled the non-quilted parts of the tree to puff out in a 3D effect. I've read several accounts of the mini-LED lights not having the final effect that was expected and that the wires & battery box on the back prevented the quilt from laying flat. A suggested alternative was to use Swarovski crystals. So, I'm going to go that route, once the quilt is squared up. I'm on the 5 yard line, folks! 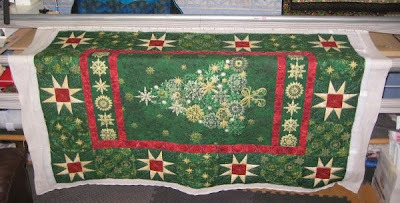 Detailed, close-up pictures will be taken when the quilt is finished. Along with almost everyone else in the country, we've been experiencing some cold weather. Of course, the 55° F in North Dakota that seems balmy would definitely be chilly-willy here! 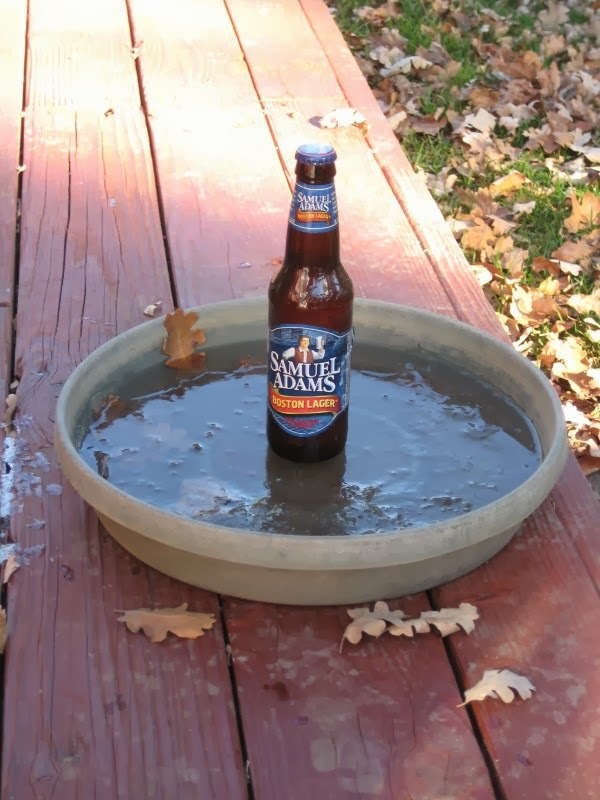 So ... just how cold did it get here last night? At least 32° F. How do I know? 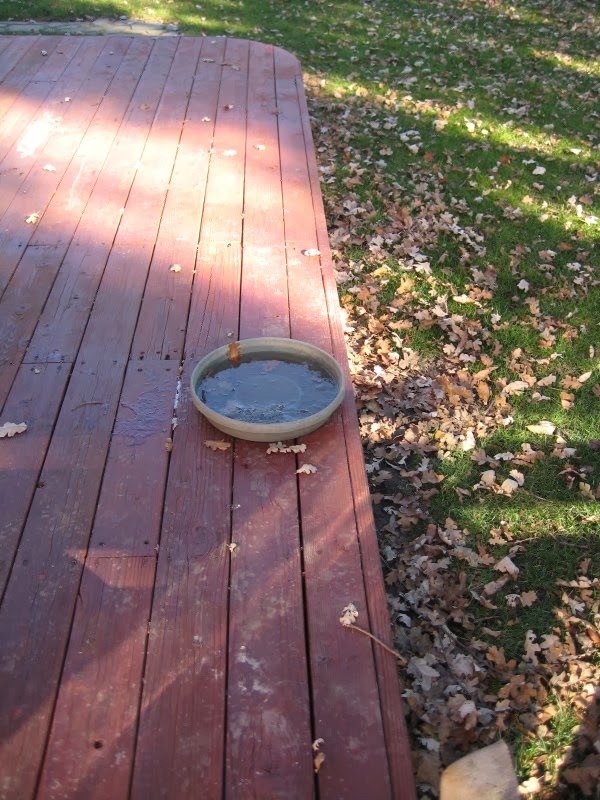 Well ... on our deck, we have a water dish for the critters. When our chickens get loose from their chicken yard and free-range, they enjoy a drink of water from it. The raccoons certainly make use of it at night. This morning, this is what the water dish looked like. Pretty normal, huh? But wait ... something doesn't look *quite* right about that water. Oh look! It's hard water! Or at least firm enough to hold up a full bottle of beer. Now *that's* cold.